Komen’s promise is to save lives and end breast cancer forever by empowering people, ensuring quality care for all and energizing science to find the cures. Though Susan lost her battle with the disease, her legacy lives on through the work of Susan G. Komen for the Cure, the organization Nancy started in her honor. Komen for the Cure is the global leader of the breast cancer movement, having invested more than $1 billion since its inception in 1982. Komen’s promise is to save lives and end breast cancer forever by empowering people, ensuring quality care for all and energizing science to find the cures. Across the country, that promise is upheld by a network of 122 local Affiliate offices. At the heart of each Affiliate is a person or group of people who, like Susan, wanted to make a difference. Fort Worth community leader Rozanne Rosenthal chartered the Tarrant County Affiliate of the Susan G. Komen Breast Cancer Foundation in May, 1992 in honor of her friend, three time breast cancer survivor Joan Katz. When Joan was diagnosed with breast cancer, Rozanne made a commitment to start a Fort Worth affiliate, and in 1992, the first Komen Tarrant County Race for the Cure attracted 1,800 participants. The Race continues to provide an opportunity for people of all ages, backgrounds and cultures to join together in a cause that is deeply personal. 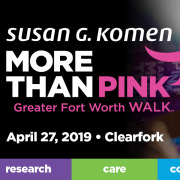 In August, 2010, the Komen Tarrant County Affiliate became the Komen Greater Fort Worth Affiliate when it added Parker, Johnson and Hood Counties to its service area. The Affiliate's Race for the Cure event became known as the Komen Greater Fort Worth Race for the Cure. Would you recommend Komen Greater Fort Worth?